Welcome to the Naismith Cup. The Raptors have not lost a step yet this season and have shown that they can compete against any team in the league. Toronto defeated the Memphis Grizzlies 99-86 at the ACC on Friday night, closing them out in the final quarter of action...and just one point shy of free pizza. Couldn't have asked for a better finish. 23 Season-high 23 points for Jonas Valanciunas who had just his second 20+ point game of the season. His stat line: 23 pts (11-15), 9 rebounds and one steal. 10 With Friday night's win, the Raptors move to 37-27 and are now ten games over .500. Ten games. I can't believe it, either. 28-2 The Raptors have closers on this team with DeMar DeRozan and Kyle Lowry on the roster. The Raps are now 28-2 when leading after three quarters and outscored Memphis 28-19 in the fourth. 22-12-7 Kyle Lowry was on triple double watch against the Grizzlies. He was just three rebounds away and finished with 22 points, 4-7 from 3pt, 12 assists, 7 rebounds, one steal and one block. 10 #10 helped the Raptors finish off the Grizzlies. DeMar DeRozan scored 10 of his 16 points in the fourth quarter. 17 Greivis Vasquez was the lone spark off of the bench for Toronto, and finished with 17 pts (6-11), 5 rebounds, 5 assists and three steals in the sixth man role. 4 The Grizzies four game win streak came to an end on Friday night. Memphis were red-hot and were winners of six of seven going into Friday's game. 16-8 The Grizzlies big man, Zach Randolph, led the Grizzlies with 16 points and 8 rebounds. 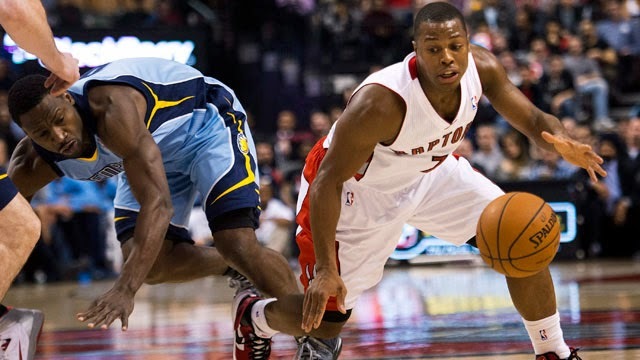 38-27 The Grizzlies have a similar record to the Raptors but are battling it out for just one the final few playoff spots in the West while Toronto sits in the third spot in the East. What a difference a conference makes. 1 Another clutch shot from DeMar DeRozan to go with a staredown of the Grizzlies bench. Pound The Rock Star of the Game: Jonas Valanciunas - 23 pts (11-15), 9 rebounds and one steal. Just one point shy of his career high.